Make Your Own Cream Cheese! Did you know that you only need one ingredient to make your own homemade cream cheese? All you need is 1 quart of whole milk (or low fat) yogurt, a large cheesecloth, a strainer or colander, and a big bowl! It's incredibly simple to do for yourself, and the only frustrating part will be having to wait to try it out! *Note: You can use low-fat yogurt, but the final result will be a bit less creamy. The basic idea of this process is that you will be draining the liquid from the yogurt. You will need to put your yogurt in a cloth thick enough for liquid to permeate (but not the yogurt itself) over a bowl that can catch the liquid. Fold a large piece of cheesecloth over three or four times and line a colander with it. Place the colander inside of a larger bowl; the colander should be raised from the bowl, since you don't want the drained liquid to touch the cloth and be re-absorbed. Pour your yogurt into the lined colander and cover it with a towel or cloth. Put the whole set-up into the refrigerator and let it drain for 5 hours! 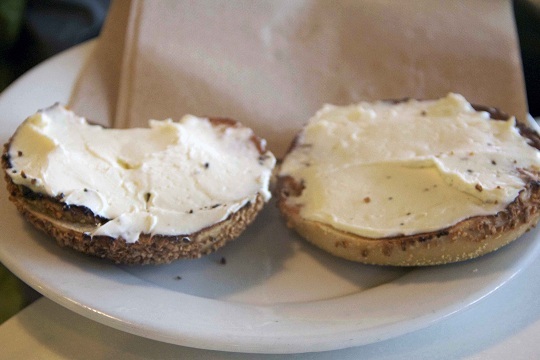 * The longer you wait, the thicker the cream cheese is likely to be. When it's ready, store your cream cheese in an airtight container and enjoy! Feel free to mix in whatever flavorings you like, whether it be chives, sun-dried tomatoes, or strawberry jam. Your homemade cream cheese should last about a month. *Note: It's good to check up on the draining process to make sure that the liquid has not gotten high enough to touch the colander and cloth. Here are a more Yummly cream cheese spreads to inspire your own creations! Shake it Up for National Margarita Day!